Be the first to hear about new products, sales and special events. What is the Rewards Card? Rewards Card is a tool to make your shopping easier and personalized. It acts as a personal electronic wallet for your REWARDS. Your card also connects you to discounts, online shopping lists, web only coupons and our Hometown Heroes Community give back program. Get alerts when there is a recall, return items with a phone call and receive offers tailored to your interests. What is the Personal Electronic Wallet? The Personal Wallet is electronically connected to your card storing your REWARDS and Offers. Protect your card at all times as it acts just like cash in the store. 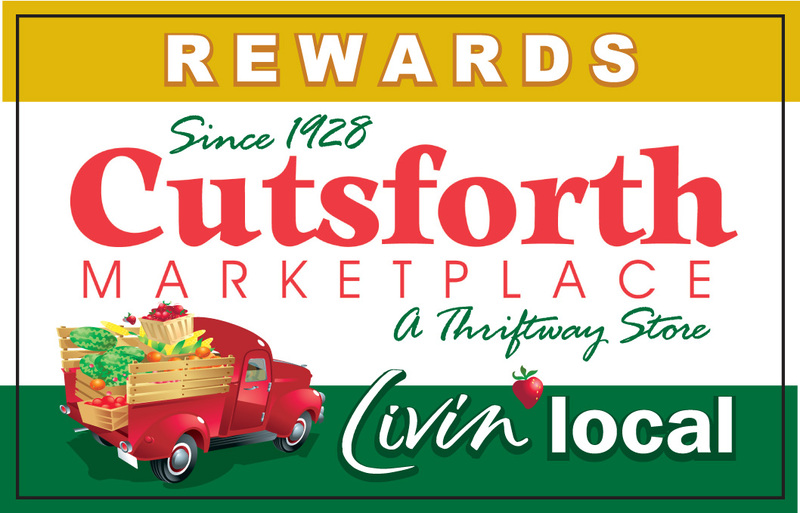 When you register at Cutsforth Marketplace, you are given a Rewards card, which recognizes you at the point of sale. Just swipe the card to earn REWARDS and use any accumulated in-store credit or save it for another shopping trip. Do I need the card to get lower prices? No, everyone gets the same low advertised price. Rewards members get benefits ts like connecting to store clubs, programs and special offers and earning REWARDS when they shop. If you lose your card, call the Store and we will disable your lost card. On your next visit, we will re-issue a new card that will be connected with your existing account. If you forget your card, you may provide the Customer Service Center or the cashier your phone number so you can earn REWARDS on that visit. For security, you can only redeem the REWARDS or any credit when you present your card at check out. Can I “cash out” my Wallet Balance? Your Wallet Balance has no “cash” value, so it cannot be “cashed-out”. Use it when you want to purchase products or Gift cards in the store or you can donate it to an approved Hometown Heroes charity. Do I have access to my purchase history? When you are a Rewards member you can access your purchase history online. You are able to search through your own history, view your REWARDS balance and even find a favorite product you previously purchased. Can family members have their own Rewards Card? Yes, each member of the family can have their own card. Your family can have one parent or primary account with each member of the family falling under that account with their own card. How can I see my virtual Wallet balance in the store? Wallet balances are made available at every check stand and at the Customer Service Center. Accumulated balances will usually be updated within a few minutes of earning your Reward. Can I use just a portion of the REWARDS I earn? Yes, you can use a portion of the REWARDS in your virtual wallet or the whole amount – you decide when and how. When I get my card, what do I do next? When the customer service center gives you the Rewards card, they will also ask for you to fill out a form that includes you name, phone number and email address. They will set up your account for you or you can go to one of our websites and do it on your own. Sandwich Club – Buy 10 Sandwiches, Get the 11th Sandwich FREE! Coffee Club – Buy 10 Coffees, Get the 11th Coffee FREE! Aisle Rewards – Look for signs on thousands of items throughout the store to earn rewards! You will be required to use your name, email and a phone number. This information will allow us to communicate with you. You may opt out of communications at any time. This information will never be released to anyone else ever. Your phone number can also be an identifier at checkout if you don’t have your card with you. How do I build a shopping list? Once you are logged into our website, you are able to add items and coupons from our weekly ad, recipes and digital offers to your shopping list. Some of the coupons/offers you select will also be loaded to your card. How will EBT & WIC Returns be handled? It is against Washington State Law for EBT credits and WIC credits to be used for anything outside of the items (products) offered for those two programs. Thus, we will not be able to apply a credit to an EBT or WIC Rewards card for use on other products. EBT & WIC returns will still need to be managed through the store. Is alcohol included in returns? State Law prohibits the return of credit or cash for any alcohol purchases including wine, beer or spirits. The only way we can accommodate a return for alcohol is if the guest comes back to the store for an exchange.